The morning started off with finalising formalities with the police, customs and immigration. Then the gendarme wanted to check all my documents were processed first and latched onto the fact that my Congo Brazzaville visa had expired. At this stage though, the chief of police had already put the relevant exit stamps in my passport on behalf of the immigration guy who was off somewhere in the village. The gendarme was now throwing his toys out the cot and after going off at me, went off at the immigration officer who had returned in the meanwhile. The latter promptly pushed the blame onto the police chief who had stamped the passport without him being present or whatever. The police chief seemed to be saying that I was leaving now so there wasn’t any problem. Typical gendarme style, the gendarme refused to budge and then the immigration guy called me into his “office”/hut with the chief of police and said that because my passport had been stamped for exit already there was nothing else he could do other than just give me a penalty, (trust me that it wasn’t as amicably explained by him as it appears here) and that would be CFA 20,000 (c.US$40). What could I do other than hand over the money. After this I also gave the police guy CFA 10,000 (c.US$20) for copping the blame. Eventually after the odd to and fro at the whim of the gendarme whom I was starting to get very irritated with, it was time to leave. The niece (very petite 18yo girl) of one of the police and her little girl was coming with me to Leconi. They did also remind me that it was Independence Day in Gabon and the border might very well be shut; will cross that bridge when I get to it. I was under no illusion as to how difficult the day might be road-wise although everyone said from that from here the road was “good” and with the truck I’d get through fine. It was 25km to Akou, the official border post of Gabon although the 2 countries’ border was somewhere in between. Now I had to check the exit out of the village which started immediately with thick sand. The explanation of which way to go sounded dubious to me at best but it was the best of the worst options. 10m away and Bang - stuck! Digging out and then eventually one local joined (the other just stood and gave orders and/or looked) and helped me dig out. Another false start and then after another couple of diggings we were out with warnings to watch for alternative routes when then there was thick sand ahead. The alternatives would usually be through bush and/or along grassy verges. It wasn’t far at all until one of our “alternative” routes took us right into woodland where we ended up with a local who turned up going ahead and chopping down branches and/or trees so we could get through and eventually back onto the road. There were several sections where I had to dig us out and use the sand-mats at least once. Getting out onto a better surface then meant I had to walk back all the way to carry the sand-mats and spade to the truck, anything between 50-200m. After a while it all starts adding up as fatigue sneaks up on me. With some slow going we got to one section that looked deceptively fine but got us stuck in very fine and thick sand. This little section of c.30m was to take us (only me digging etc though - girl was in the cab with her 2yr old) over 5 hours to get out! At this stage I was quite knackered already (over and above all the work the day before) and I was going through various emotions and talking to myself. Needless to say that sod’s law entered the equation and as I started digging, the clouds drifted away and the sun came out in all it’s fury. I only had one bottle of water in the cab and two in the fridge in the back and was very much aware of the heat and thirst inducing physical work of digging and setting the sand-mats. When I got back in the cab, the truck only went the distance of the sand-mat and then dropped deep into the sand again. I had to go ahead of the truck as well and dig away at the centre section as the diff and spare wheel kept digging into it the moment the wheels went a little deeper than the surface of the sand. By the 4th or 5th time, I was getting seriously frustrated, depressed and thirst was becoming an obsession whilst I was also trying to save my water because I had very little and didn’t know when I’d get out of here. I was also reaching a point of physical exhaustion where I had to sit down for a few moments between different parts of the digging and sand-mat process and just try and blank my brain so I could carry on in some sort of automaton fashion. This wasn’t always possible and already my mind was kindly painting me pictures with me featuring in the well known cartoon of a guy crawling through the desert looking for water. Water was now the omnipresent ghost on my mind. In the distance some rains had started and I was thinking/hoping that it would reach us even if only for a few minutes to cool things off and settle the sand a bit (although more than a few minutes would be needed for the latter). No idea what kept me going but thoughts of just sitting down and waiting crossed my mind several times. I was also dehydrating at a phenomenal rate and even more frustratingly recognised all the symptoms of heat and dehydration in myself. This was when it was sit down time again for a few minutes before carrying on. My mind also started playing tricks on me (damn, was I this far out of it already?) and reminding me of all the things that happened to people stranded in dry, hot areas without any water and wondering when, if ever, there be another vehicle and/or people. Across the hills there was no sign of any other life in the form of people or even a hut. The 2yr old then started asking her mother for water! I could maybe hold out on the mother (just because she’s silly not taking any water or something to drink with) but I couldn’t on the child. Her mother helped her drink a few mouthfuls of water that seemed to satisfy her that all was still well. When I did get out onto more solid surface and dared to stop, I had to trudge back to go and get the sand-mats although only about 50m this time. 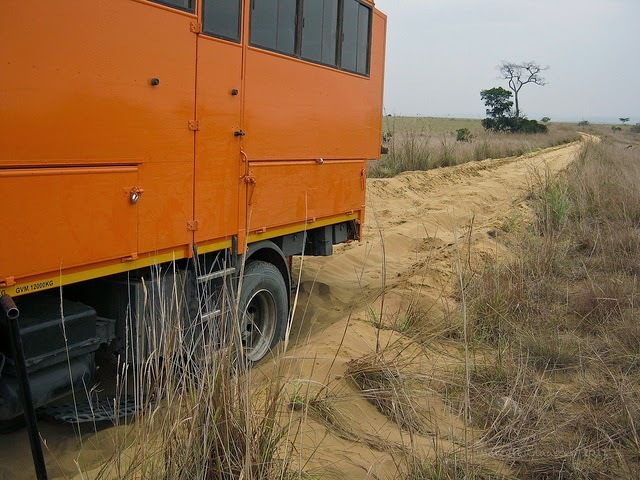 After this there was one more section where it seemed we’d be stuck but the truck managed to crawl through in 1st gear and diff lock and it was here that I noticed that according to the gps we were in Gabon already. This was brilliant news as I knew Akou was not far from the main country border. Then all of a sudden, a new tar road and an open barrier with nobody present. We’d arrived in Gabon!! (it had taken me 10hours to do 25km to this point!) Driving on a little way we found a shop/bar where I had a huge Fanta and the locals first expressed their surprise at me doing the road alone (as is usual it seems whenever I arrive somewhere) and then pointed me in the direction of Leconi. Getting to the edge of Leconi there was the 1st gendarme barrier and a rather rude guy who just straight out told me that the frontier was closed for Fete National (national holiday). He even denied my requests to stay over for the night nearby as it was past 5pm already. Then he took to interviewing/interrogating the girl that was getting a lift with me and after about 20min gruffly told me to go ahead to Leconi. Apparently customs and immigration were there but I could only do formalities in the morning. I dropped the girl off in town and carried on to one lodge/hotel where they had no room but a guy there said he would show me another place. The next place was also in the throes of festivities but the owner immediately came and got me sorted out with a room with en-suite bathroom and said that later the night I could park the vehicle inside their walled compound. I emerged from a very long shower and ready, in a knackered sort of way, to go and find a Gabonese sim card, airtime and a bit of food and let people know where I am. It was almost surreal being in a town and thinking what I’d worked my way through the last 2 days. Just to add insult to injury, I tripped into a ditch and slammed my right knee real hard - or is that adding injury to insult? A nearby shopkeeper brought out something he had in the shop and rubbed my knee painfully hard amidst my protests that it was a bruise and not just a pulled muscle. Back at the hotel, I had a beer then pulled the truck into the compound. I slept like a log that night, once or twice waking up confused not knowing where I was.